OX40 ligand (OX40L) expressed on APCs, and its receptor, OX40 present on activated T cells, are members of the TNF/TNFR family, respectively, and have been located at the sites of inflammatory conditions. We have observed in OX40L-deficient mice (OX40L−/−) an impaired APC capacity and in our recently constructed transgenic mice expressing OX40L (OX40L-Tg), a markedly enhanced T cell response to protein Ags. Using these mice, we demonstrate here the critical involvement of the OX40L-OX40 interaction during the T cell priming events in the occurrence of experimental autoimmune encephalomyelitis (EAE). In OX40L−/− mice, abortive T cell priming greatly reduced the clinical manifestations of actively induced EAE, coupled with a reduction in IFN-γ, IL-2, and IL-6 production in vitro. Adoptive transfer experiments however revealed an efficient transfer of disease to OX40L−/− mice using wild-type donor T cells, indicating an intact capacity of OX40L−/− mice to initiate effector responses. On the other hand, OX40L−/− donor T cells failed to transfer disease to wild-type recipient mice. Furthermore, OX40L-Tg mice developed a greater severity of EAE despite a delayed onset, while both OX40L-Tg/CD28−/− and OX40L-Tg/CD40−/− mice failed to develop EAE demonstrating a requisite for these molecules. These findings indicate a pivotal role played by OX40L in the pathogenesis of EAE. One essential feature upon TCR engagement of the peptide-MHC complex is the widely accepted view that costimulatory signals are essential to achieve robust and full T cell activation. Recently, OX40 ligand (OX40L)3 along with other members of the TNF family, namely, CD40L, 4-1BBL, CD70, and Trance, have been known to be major participants in this T cell-APC interaction upon binding to their cognate receptors (1, 2, 3, 4, 5, 6). OX40L, a molecule that we identified as gp34 whose expression on T cells is regulated by the tax gene of the pathogenic human retrovirus, human T cell lymphotropic virus type 1 (7), has been shown to constitute a component of this essential second signal following TCR stimulation. We and others have recently described the expression of OX40L on B cells and an array of professional APCs in a CD40-dependent manner (8, 9, 10, 11). Interestingly, OX40L has also been found on activated T cells, with a markedly enhanced expression in activated OX40−/− T cells (12). The receptor for OX40L, OX40 has been reported to be restricted to activated T cells (13, 14, 15). Together with OX40, both have been widely accepted to play a significant role in providing critical costimulation for both CD4 and CD8 T cell activation (1, 2, 10). Recently, OX40L and OX40 have been detected in the tissues of several inflammatory disorders such as EAE, semiallogeneic graft-versus-host disease, and proliferative lupus nephritis (16, 17, 18, 19, 20). The multitude of functions attributable to OX40L is expanding. In an effort to reveal the biological function of OX40-OX40L interactions, we proceeded further by generating mice deficient in OX40L. These mice revealed substantial new information demonstrating a marked failure in APC function among dendritic cells when antigenically challenged (10). In addition, we and others have shown that the absence of OX40L signals failed to support potent CD4+ T cell responses, resulting in a reduced Th1 and Th2 cytokine profile in mice (10, 12, 21, 22). Beside providing potent costimulation, OX40-OX40L is suggested to be involved in redirecting a Th2-biased response (23, 24, 25, 26), maintenance, and survival of memory T cell populations (27). Amid much debate, the involvement of OX40-OX40L in altering Ab responses (10, 12, 21, 22, 28) and T cell migration (16, 29, 30, 31) has been suggested. Recently, in concert with CD28, OX40 has been further proposed to synergistically potentiate immune responses and participate in T cell migration to B cell areas (17, 32). Furthermore, antitumor immune responses have been attributable in part to OX40-OX40L signals (33, 34). Collectively, these data provide a potential key role for OX40-OX40L interaction in the immune regulation of various autoimmune diseases. Experimental autoimmune encephalomyelitis (EAE), reminiscent of human multiple sclerosis, can be induced in C57BL/6 mice with either myelin oligodendrocyte glycoprotein peptide (MOG), a highly immunogenic myelin component, or adoptive transfer of TCR+ cells, specific for encephalitogenic antigens. Although recent studies blocking this interaction using anti-OX40L mAbs or an OX40-fusion protein have been shown to ameliorate not only EAE, but graft-versus-host disease, inflammatory bowel disease, and asthma in murine models (16, 17, 23, 29, 35), the molecular mechanisms by which OX40L exerts its influence in autoimmune disorders have remained unclear. Using OX40L-deficient mice and mice constitutively expressing OX40L, we attempted to follow the immunological events during EAE induced by MOG and to provide an understanding of the underlying contributory mechanisms of the OX40L-OX40 interaction in autoimmune pathogenesis. The C57BL/6 mice, homozygous for OX40L mutation previously reported (10), had been backcrossed between 9 and 11 generations and typed by PCR using ear biopsy-derived DNA. The OX40L-transgenic mice were constructed on the C57BL/6 background by using an lck promoter and constitutively expressed OX40L on T cells (K. Murata, N. Ishii, M. Nose, M. Yamada, L. C. Ndhlovu, and K. Sugamura, unpublished data). CD28−/− mice were obtained from The Jackson Laboratory (Bar Harbor, ME) and CD40−/− mice were a kind gift from Dr. Kikutani (Osaka University, Osaka, Japan). All mice were 6–8 wk old at the start of experiments and wild-type littermates were used as controls. MOG35–55 (MEVGWYRSPFSRVVHLYRNGK) peptide was provided by Sawady Technology (Tokyo, Japan) and had been synthesized by F-moc solid-phase methods to a purity of 95–100% through HPLC. Anti-mouse OX40L mAb, which blocks the OX40-OX40L interaction (10) and control rat IgG (Cappel, Durham, NC) were used during the experiments. A single s.c. injection of 100 μg of MOG35–55 peptide dissolved in PBS, emulsified in an equal volume of CFA (Difco, Detroit, MI) containing 4 mg/ml Mycobacterium tuberculosis H37Ra (Difco), was administered on both flanks followed by an i.v. injection of 500 ng pertussis toxin (List Biological Laboratories, Campbell, CA) dissolved in 200 μl sterile PBS administered on the day of immunization and 48 h later. Wild-type mice were immunized with 100 μg MOG35–55 in CFA (Difco). Fifteen to 20 days later, draining lymph nodes were harvested, and MOG-specific lymphocytes were cultured with 10 μg/ml MOG35–55 in RPMI 1640 medium (Life Technologies, Gaithersburg, MD) supplemented with 2 mM l-glutamine, 100 U/ml penicillin, 100 μg/ml streptomycin, 1 mM sodium pyruvate, 1× nonessential amino acids, 50 μM 2-ME, and heat-inactivated 10% FCS. Human rIL-2 (15 pg/ml; Ajinomoto, Kanagawa, Japan) was added on day 2. After 4 days of culture, cells were washed and resuspended in PBS and adjusted to the required concentration for transfer. Wild-type or OX40L−/− recipients received 3 × 107 cells i.v. in a 0.2-ml suspension via the tail vein, as well as 200 ng of pertussis toxin (List Biological Laboratories) immediately after cell transfer and 2 days later. In both groups, mice were examined daily for signs of EAE and scored as follows (36): 0, no disease; 1, tail paralysis; 2, hind limb weakness; 3, hind limb paralysis; 4, hind limb plus forelimb paralysis; or 5, moribund and dead. Mice were immunized s.c. with 100 μg of MOG35–55 emulsified 1:1 in CFA (Difco). Draining lymph nodes were harvested at the indicated days, and single-cell suspensions were prepared. Whole draining (axillary and inguinal regions) lymph node cells were cultured in 96-well plates at 5 × 105 cells/well with a range of concentrations of MOG35–55 peptide in RPMI 1640 medium supplemented with 10% FCS. Plates were pulsed with [3H]thymidine (New England Nuclear, Boston, MA) at 1 μCi/well on day 3 of culture for the final 18 h. Mean incorporation of thymidine in DNA was measured in triplicate wells by a 1450 Microbeta Plus liquid scintillation counter (Wallac, Turku, Finland). Thymidine incorporation was used as a measure of cell proliferation and DNA synthesis. Mononuclear cells were isolated from murine brains as previously described (37). Briefly, brains were removed from donor animals, and a single-cell suspension was prepared by passage through a wire mesh. Cells were washed in RPMI 1640 medium and mononuclear cells were isolated using a discontinuous Percoll gradient (Pharmacia, Piscataway, NJ). The cells were washed three times and the CD11b+ and CD4+/CD8+ cell fractions were isolated from the CNS by magnetic separation. Initially, the cells were magnetically labeled with either MACS CD11b+ or MACS CD4+ and CD8+ Microbeads (Miltenyi Biotec, Gladbach, Germany) and incubated at 4°C for 20 min, washed, and passed through a nylon mesh. The different cell subsets were then purified by using an autoMACS (Miltenyi Biotec). Magnetic separation with positive selection columns was performed twice. Analysis using a FACSCalibur flow cytometer (BD Biosciences, Mountain View, CA) determined the cells to be >90% pure for microglia/macropages and T cells using CD11b+-FITC/CD45+-PE and TCRβ+-FITC mAbs (BD PharMingen, San Diego, CA), respectively. After blocking the cells with the relevant ascitic fluid, cells were incubated directly with the following conjugated mAb in FACS buffer (1% BSA, 01% sodium azide in PBS); CD11b+ FITC (BD PharMingen), Bio-MGP34 (10), streptavidin-allophycocyanin and control human CD8+-FITC (both from BD Biosciences); and Bio-CD80+, Bio-CD86+, and CD45+-PE (all obtained from Beckman Coulter (Fullerton, CA)). CD11b+ brain cells were extracted from OX40L+/+ and OX40L−/− at the onset and peak of disease as described above and total RNA was extracted using TRizol reagent (LTI; Life Technologies). First-strand cDNA was prepared using the Superscript RT-PCR system (Life Technologies) from 5 μg of total RNA. The cDNA amount was normalized by measuring the CD86 expression, and OX40L transcripts were analyzed by RT-PCR using specific primer sequences for mouse (m)OX40L and mCD86. Reactions were performed in a programmable thermal controller (PerkinElmer/Cetus, Norwalk, CT) and after amplification, 20 μl of PCR product was separated by electrophoresis on a 1.5% agarose gel and visualized by ethidium bromide staining. Lymph node cells were prepared and cultured as described above with medium alone or in the presence of 50 μg/ml MOG35–55 peptide in RPMI 1640 medium supplemented with 10% FCS. Supernatants were harvested at 48 and 72 h of culture. The concentrations of IL-2, IL-4, IL-6, IL-10, and IFN-γ were measured by quantitative capture ELISA according to the guidelines of the manufacturers (R&D Systems, Minneapolis, MN). Brains were removed and fixed in 10% Formalin. Six-μm-thick paraffin-embedded sections were stained with Luxol fast blue or H&E for light microscopic examination. Evidence of meningeal and parenchymal inflammatory foci and features of demyelination were examined by an unbiased observer. To investigate the role of OX40L-OX40 interactions in the regulation of MOG-induced EAE, we first compared the severity of actively induced EAE between OX40L-deficient (OX40L−/−) mice and wild-type (OX40L+/+) littermates. The susceptibility in the development of clinical signs of EAE was significantly reduced in the OX40L−/− mice when compared to the OX40L+/+ littermates (Fig. 1A and Table I⇓). Consistently the wild-type littermates developed more severe EAE signs and the chronic pattern of disease characteristic of MOG-induced EAE was observed. We also observed a similar reduction in disability of MOG-induced EAE in mice treated with our anti-OX40L mAb, MGP-34 (data not shown), an inhibitory mAb blocking the interaction between OX40L and OX40 (10). Histological examination of these mice at the peak of disease disability (day 17) and the end of the experiment (day 35) were conducted. Despite visible perivascular infiltrations of mononuclear cells in the brain and spinal cord of both OX40L−/− and OX40L+/+ mice, the extent of cellular infiltrations in the inflammatory foci was not significantly different (Fig. 1B, upper panel). Extensive demyelination in the white matter of the brains was present in the OX40L+/+ mice throughout the disease course (Fig. 1B, lower panel). OX40L−/− mice, however, also developed demyelinating lesions after sensitization with MOG, but to a still unknown extent (Fig. 1B, lower panel). We previously demonstrated a defective generation of Ag-specific T cell responses in OX40L−/− mice (11). To test whether this defect participated in the reduced progression of EAE in the OX40L−/− mice, we restimulated draining lymph node cells from both the OX40L−/− and OX40L+/+ mice extracted at several time points after immunization with MOG. A series of proliferative assays consistently presented a picture of profound impairment in the T cell responses in the OX40L−/− mice, with a 3-fold reduction in proliferative response as compared to the OX40L+/+ mice, both early (day 13; Fig. 2A) and late (day 29; data not shown) during the disease. Supernatants extracted from the cultures were analyzed for cytokine release of IFN-γ, IL-2, IL-4, IL-6, and IL-10. 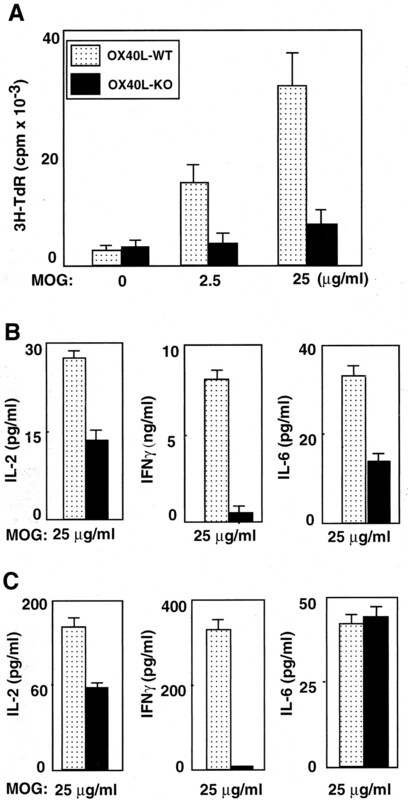 The cells derived from OX40L−/− mice produced lower levels of IL-2 and IFN-γ at day 13 (Fig. 2B) and day 29 (Fig. 2C). Although IL-6 levels were lower at day 13, comparable levels of IL-6 by day 29 were seen when compared with those derived from the OX40L+/+ mice (Fig. 2⇓, B and C). Levels of IL-10 were not significantly different and IL-4 production was undetectable in the two groups (data not shown), suggesting a redirection to a Th2 bias unlikely. In summary, the compiled analysis of the T cell responses in the OX40L−/− mice suggests impairment in proliferative responses and Th1 cytokine release. Suppressed clinical disease in actively induced EAE in the absence of OX40L. A, Clinical comparison of disease severity between OX40L+/+ (•) and OX40L−/− (○) mice (n = 5/group). Animals were immunized with MOG/CFA in both flanks and received pertussis toxin on days 0 and 2. Mice were monitored for symptoms daily. One representative experiment of three separate experiments is shown. B, Histopathological profiles of brains of affected OX40L+/+ and OX40L−/− mice on day 35 after immunization. Brains were harvested, fixed in Telly’s fixture solution, and embedded in paraffin. Six-micrometer sections were stained with H&E (upper panel) and Kluver-Barrera (lower panel) stain; Blue staining is indicative of myelin. On average, 15 sections were made per mouse and results are based on sections from 5 mice in each group with DAS ranging from 2 to 3. Original magnification, ×100. WT, Wild type; KO, knockout. OX40L contributes to the MOG-specific proliferation and cytokine production in draining lymph nodes. OX40L+/+ and OX40L−/− (n = 3/group) mice were immunized with MOG/CFA and draining lymph nodes were isolated on days 13 and 29 after immunization. The cells were restimulated in vitro with either medium alone or various concentrations of MOG peptide. Day 29 after immunization proliferation was measured by thymidine incorporation and is represented as a mean cpm in triplicate (A). Culture supernatants were collected at 48 and 72 h for cytokines by ELISA on day 13 (B) and day 29 (C) after immunization, respectively. Data represent three independent experiments. WT, Wild type; KO, knockout. In an effort to determine the localization of OX40 and OX40L expression in the brains of mice during EAE, we initially carried out flow cytometric analysis of the inflammatory cells in the brains extracted on day 35 after immunization. OX40L was undetectable throughout the disease in the Mac1+ fraction of both OX40L+/+ and OX40L−/− mice (Fig. 3A). RT-PCR was next performed using RNA extracted from the Mac1+ CNS population to help determine whether OX40L is indeed expressed in the CNS during EAE. Two distinct sets of primers each for murine OX40L and CD86 were used. The amplification products were visible for OX40L mRNA at the onset of disease in OX40L+/+ mice and not in OX40L−/− mice (Fig. 3C). Expression of CD86 (Fig. 3⇓, A and C) and CD80 (data not shown) were comparable between the two groups at the peak of disease both by flow cytometry and RT-PCR. On examination of the infiltrating T cells in the brain, only OX40 was clearly expressed on the T cell population (Fig. 3B) at the peak of disease in both OX40L+/+ and OX40L−/− mice. Analysis of costimulatory molecules during EAE. CD11b+ and TCRβ+ populations in brain tissues were isolated at several time points from OX40L+/+ and OX40L−/− mice after active EAE induction. FACS staining analysis was next performed. The CD11b+ fraction (A) and the TCRβ+ isolated cells (B) at the onset of disease. The cells were stained with the various costimulatory Abs and are depicted by the thick lines. Dotted lines/gray shaded areas indicate control staining. No expression of these costimulatory molecules were readily present in unimmunized animals. Samples were analyzed with a FACSCalibur flow cytometer (BD Biosciences) and representative data of four independent experiments are shown. RT-PCR analysis of CD11b+ brain cells from OX40L+/+ (lane 3) and OX40L−/− (lane 4) at the onset of EAE (C). Total RNA was extracted from the brain tissue and as control, RNA was extracted from freshly isolated dendritic cells (lane 1) and overnight activated splenic dendritic cells (lane 2), recovered by using MACS CD11c+ microbeads. First-strand cDNA was prepared and the cDNA amounts were normalized by measuring the CD86 expression. OX40L transcripts were analyzed using specific primer sequences for mOX40L and mCD86 by RT-PCR. We generated a transgenic mouse line, overexpressing OX40L specifically in T cells under the control of the lck promoter (Fig. 4A). The mice developed normally but exhibited a markedly enhanced proliferative and cytokine responses to protein Ags (K. Murata, N. Ishii, M. Nose, M. Yamada, L. C. Ndhlovu, and K. Sugamura, unpublished data). We here induced EAE in the OX40L-transgenic (OX40L-Tg) and their counterpart wild-type littermates by immunization with MOG. As predicted, a more severe progression of EAE and greater mortality as compared to the wild-type mice developed, and, interestingly, the OX40L-Tg mice developed a delayed onset of symptoms (Fig. 4B and Table I⇑). Comparable perivascular infiltrations of mononuclear cells (data not shown) and extensive demyelination (Fig. 4C) between the OX40L-Tg mice and the wild-type mice was observed in histological brain sections. Next, draining lymph node cells derived from the OX40L-Tg and wild-type mice immunized with MOG in vivo were then restimulated with MOG in vitro and assayed for proliferation and cytokine production. The OX40L-Tg lymph node cells hyperproliferated in response to MOG as compared to control wild-type lymph nodes (Fig. 5A). Significantly elevated levels of IL-2, IL-6, and IFN-γ were present in the culture supernatants of lymph node cells derived from the OX40L-Tg mice as compared with the wild-type mice (Fig. 5B). No significant difference in the levels of IL-10 was seen between the two groups, and as expected IL-4 production was undetectable (data not shown). These results appeared to be a reversal of the patterns observed in the OX40L-deficient mice. Given the diminished clinical disease upon active EAE induction in the OX40L−/− mice, and the observation that OX40L-Tg mice developed a more severe disease, we raised the question of how the alteration in OX40L expression influenced Ag-specific reactivity of the primed encephalitogenic T cells. Hence, we carried out a combination of adoptive transfer experiments. First, OX40L+/+ MOG-specific donor T cells were transferred into OX40L−/− and OX40L+/+ recipient mice. The incidence of disease was 100% in both groups of mice with an earlier onset of EAE in the OX40L−/− mice (day 15.4) as compared to the OX40L+/+ mice (day 18.6; Fig. 6⇓ and Table II⇓). The disease severity in the OX40L−/− mice (maximum disability score (DAS), 2.8) was remarkably similar to the wild-type mice (maximum DAS, 2.9; Table II⇓). 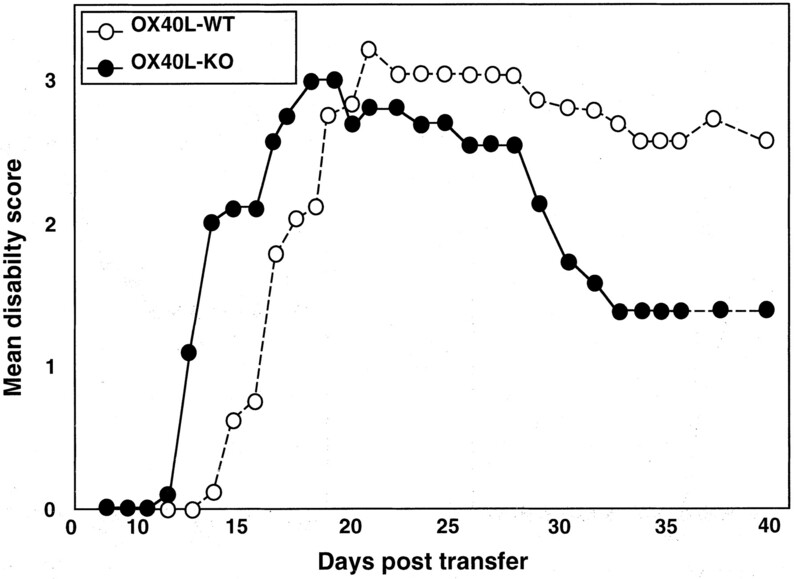 However subsequent recovery of disability was noted in the OX40L−/− mice but not in the OX40L+/+ mice after adoptive transfer (Fig. 6⇓). Severe course of clinical disease in actively induced EAE in OX40L-Tg mice. The following Tg mouse line is overexpressing the sequence encoding OX40L under the control of the lck proximal promoter. OX40L is strongly expressed on naive T cells as detected by biotinylated anti-OX40L mAb (A). Clinical comparison of disease severity between OX40L-Tg (•, n = 6) and OX40L-wild-type (WT) littermates (○, n = 9) after induction with MOG/CFA (B). Data are representative of three separate experiments. Histopathological profiles of brains of affected OX40L-Tg and OX40L-WT mice on day 35 after immunization (C). Brains were harvested and prepared as described previously. Sections were stained with H&E and Kluver-Barrera stain; blue staining is indicative of myelin. On average, 15 sections were made per mouse and results are based on sections from 4 mice in each group with average DAS of 3. Original magnification, ×100. OX40L contributes to the MOG-specific proliferation and cytokine production in draining lymph nodes. OX40L-WT and OX40L-Tg (n = 3/group) mice were immunized with MOG/CFA and draining lymph nodes were isolated on day 35 after immunization. The cells were restimulated in vitro with either medium alone or various concentrations of MOG peptide. Day 35 after immunization proliferation was measured by thymidine incorporation and is represented as a mean cpm in triplicate wells (A). Culture supernatants were collected at 48 and 72 h for cytokine assay by ELISA on days 13 and 35 (B) after immunization. Data represent three independent experiments. WT, Wild type. OX40L−/− recipient mice develop acute EAE. Comparison of OX40L+/+ and OX40L−/− mice after transfer to each mouse of 3 × 107 Ag-activated T blasts from OX40L+/+ mice. WT, Wild type; KO, knockout. Strikingly, when we transferred the OX40L−/− donor T cells to OX40L+/+ recipient mice, only few if any mice developed symptoms, and those that did with very mild disability (maximum DAS, 1.5) throughout the observation period (Table II⇑). On the other hand, when we transferred OX40L-Tg donor T cells to wild-type recipient mice, despite a delayed onset of disability, a severe disease pattern with a higher mortality among the mice was observed (Table II⇑). These data reinforce the data demonstrating the requirement for OX40L signals in providing adequate costimulation for Th cell differentiation and thus enabling them to provide an environment conducive for EAE progression. CD28 and OX40 have been reported to synergistically provide additional T cell costimulation in vitro (2, 17). Furthermore, it has been documented that both molecules may also be involved in the migration of T cells into B cell follicles through the up-regulation of CXCR5 (11, 32). To further dissect whether OX40L could compensate for CD28 signals, OX40L-Tg mice were crossed with CD28−/− mice to eliminate the CD28 costimulation component. These mice were immunized with MOG/CFA and observed for signs of EAE. When compared to the wild-type littermates both OX40L-Tg/CD28−/− (incidence, 0/3) and CD28−/− (incidence, 0/4) mice failed to develop EAE (Fig. 7⇓). CD28−/− mice have been reported to have a marked failure to develop EAE (36). Thus, although CD28 is dispensable in some immune responses (38, 39), OX40L function requires initial CD28 costimulation. Dependence of intact CD28 signals for OX40L costimulation during EAE. Actively induced EAE in CD28KO/OX40L-Tg (n = 3), WT (n = 2), OX40L-Tg* (n = 4) CD28KO/OX40L-WT (n = 4). Data are representative of one of two separate experiments. ∗, One mouse died of severe EAE. KO, Knockout; WT, wild type. 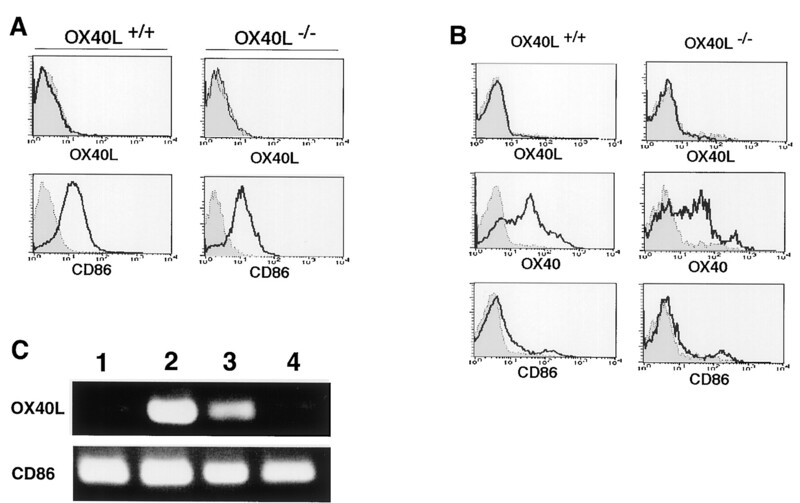 We previously described that a critical CD40 trigger is required for OX40L expression (10). Furthermore, it is unclear whether the impaired T cell function observed in CD40L−/− mice may partly be due to OX40L dysfunction (3). CD40L−/− and CD40−/− mice have been demonstrated to have a marked failure to develop EAE (3, 40). These lines of evidence led us to determine the effect of functional OX40L expression and signaling in the absence of CD40. 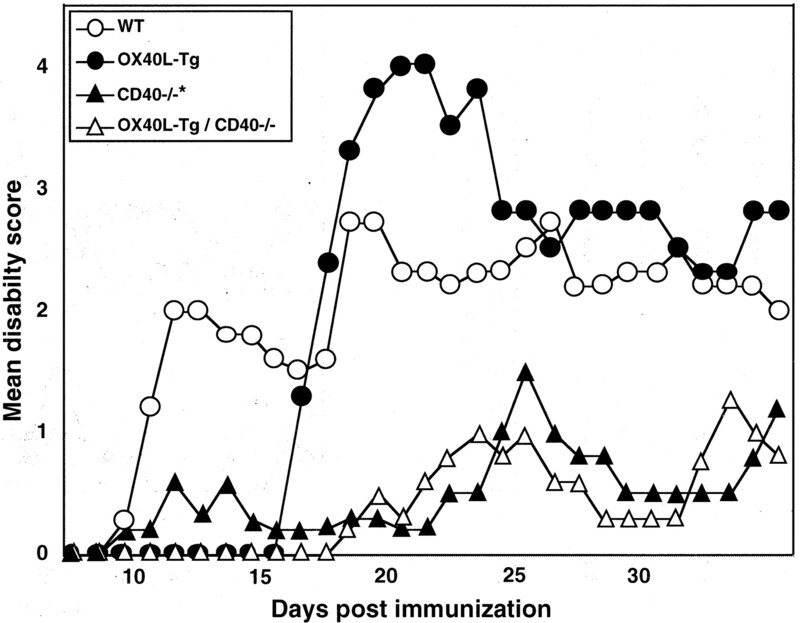 We crossed OX40L-Tg mice with CD40−/− mice to bypass the CD40 component. These mice were immunized with MOG/CFA and observed for signs of EAE. When compared to the wild-type littermates (mean peak DAS, 3.0 ± 0.3), both OX40L-Tg/CD40−/− (mean peak DAS, 1.8 ± 0.6) and CD40−/− (mean peak DAS, 2.1 ± 0.9) mice develop minor symptoms of EAE (Fig. 8⇓). OX40L-Tg mice consistently presented with severe disease (mean peak DAS, 4.0 ± 0.0) (Fig. 8⇓). 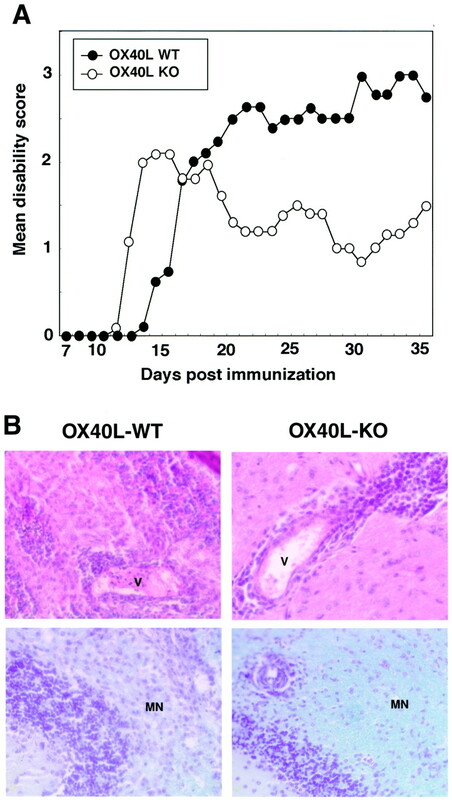 The findings here further emphasize that effective OX40L function requires both intact CD28 and CD40 signals during EAE pathogenesis, possibly through their ability to up-regulate OX40. Intact CD40 signals are essential for OX40L function. Actively induced EAE in CD40KO/OX40L-Tg (n = 3), WT (n = 3), OX40L-Tg (n = 2) CD40-KO/OX40L-WT (n = 3). Data are representative of one of two separate experiments. KO, Knockout; WT, wild type. We revealed here the mechanisms by which OX40L participates in the pathogenesis of EAE. EAE replicates the debilitating human disease multiple sclerosis and is primarily a T cell-mediated autoimmune disease leading to events that result in demyelination (41). During active EAE induction, the modulation of the disease was clearly revealed using OX40L−/− and OX40L-Tg mice; MOG-induced EAE was either suppressed or enhanced according to the expression of OX40L, with the priming stages of EAE induction strongly requiring OX40L signals. Further analysis of the T cell responses displayed a reduced proliferative potential and cytokine response in the OX40L−/− T cells and, conversely, markedly elevated responses in the OX40L-Tg T cells in vitro. The effective transmission of EAE to OX40L−/− recipient mice using wild-type encephalitogenic T-cells indicated that these effector T cells were able to induce disease in OX40L−/− mice and function normally. However, early recovery from paralysis in the OX40L−/− recipient mice suggests that these effector T cells are unable to sustain the chronic nature of disease in the absence of continued OX40L signals. This is in line with reports suggesting that OX40-OX40L interactions may function effectively in sustaining the survival of memory T cells (27). On the other hand, the failure to transduce disease to wild-type recipient mice, using encephalitogenic T cells lacking OX40L, suggests that the priming of these T cells was adversely affected and hence their ability to induce disease diminished. 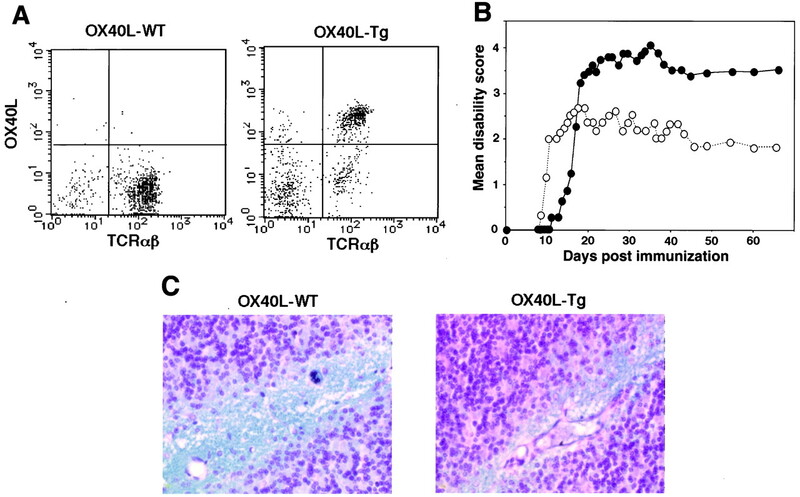 Adoptive transfer of OX40L-Tg T cells further reinforced our findings using OX40L−/− mice. The delayed onset pattern seen in the OX40L-Tg mice is still an unresolved phenomenon. The kinetics of OX40 and OX40L expression on T cells and APCs, respectively, may not be responsible as both are expressed within a few days after antigenic challenge (10). 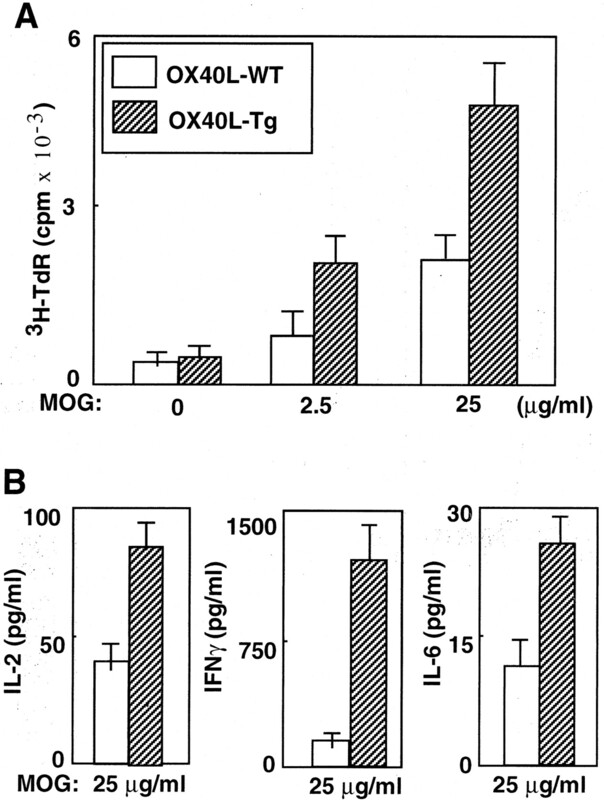 OX40L appears to promote Th1 cytokine production stimulated by MOG in vitro. A significant reduction in both IFN-γ and IL-2 of in vitro-stimulated OX40L−/− T cells was observed. OX40L-Tg mice, as expected, had higher proliferative and cytokine responses as compared to the wild-type T cells and appears to correlate with responses we revealed using keyhole limpet hemocyanin peptide (our unpublished data). EAE is usually referred to as being a Th1-mediated disease (42, 43); however, the role of Th1 cytokines remains highly contentious. Both IFN-γ- and TNF-α-deficient mice have been shown to be highly susceptible to EAE (43, 44, 45). Thus, the altered Th1 cytokine responses we observed could be due to an overall inability of the T cells to differentiate into both Th1/Th2 effectors. Noteworthy however was the finding that a reduction of IL-6 production by OX40L−/− draining lymph node cells and a concomitant increase in IL-6 production in the OX40L-Tg lymph node cells may render this cytokine paramount in the pathogenesis of EAE. Indeed, elevated IL-6 levels in the culture medium just prior to adoptive transfer further highlights the ability of OX40L to enhance IL-6 secretion, at least in the early stages of the disease (data not shown). In fact, IL-6−/− mice have complete suppression of EAE, making IL-6 an essential inflammatory cytokine involved in EAE pathogenesis (46). The nonlymphoid cells such as CNS resident cells and infiltrating macrophages were examined in light of the limited demyelination seen in the brain tissues of OX40L−/− mice. Myelin lacks MHC expression, suggesting that effector T cells cannot directly recognize and damage myelin, and thus microglia/macrophages in addition may participate directly in myelin destruction (47). OX40L was not detected among the CD11b+ microglia/macrophage population by flow cytometry throughout the disease. This result is in direct conflict with a report showing strong OX40L expression in SJL/J mice after proteolipid protein-induced EAE in vivo (17). We however were able to detect mRNA expression in the same population in OX40L+/+ mice but not in the OX40L−/− mice. The continued presence of OX40 may be responsible for the down-regulation/internalization/shedding of OX40L expression in vivo. Indeed, activated OX40−/− T cells in vitro allow for the easy detection of OX40L on T cells which are not readily detectable in wild-type mice (12). Although there is no direct evidence, OX40-OX40L has been suggested to participate both directly and indirectly in the migration of immune cells (11, 16, 32). This has further been highlighted by reports observing OX40 and OX40L expression in vascular endothelial cells (16, 30, 48). Interrupting OX40L signals however did not alter the expression of several integrin family members (16). Furthermore, normal migration of OX40L−/− dendritic cells has been described after sensitization (21). Most significant however is a recent study demonstrating that migratory encephalitogenic T cells did not express OX40 in the periphery (spleen), but this molecule was then re-expressed in the brain, thus making OX40 an unlikely candidate involved in cell migration (31). We observed a large number of inflammatory cells in the brain sections of OX40L−/− diseased mice. In addition, adoptive transfer of encephalitogenic T cells derived from wild-type mice to recipient OX40L−/− mice were able to migrate to the CNS in sufficient numbers to induce disease. 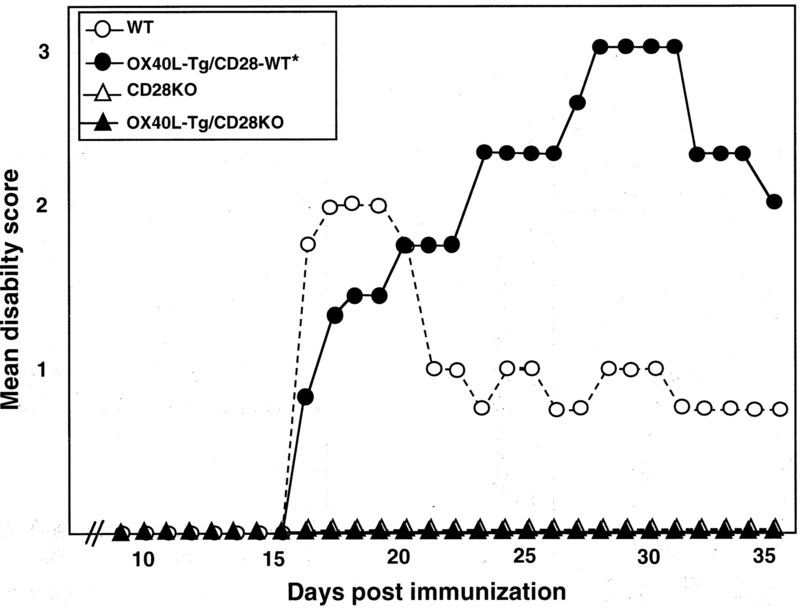 From our findings using OX40L-Tg, it is clear that CD28 signals are essential for OX40-OX40L interactions and may affect expression of the T cell activation Ag OX40 both in vivo and in vitro. However, CD28 is dispensable in some immune responses (38, 39), and it has been documented that they may also synergistically coordinate with OX40 in providing significant T cell costimulation (17). Recent suggestions go further, theorizing that OX40L costimulation alone is sufficient to drive significant costimulation in a CD28-independent manner (49). Our result demonstrates that blockade of CD28 signals interrupts the sequential costimulatory pathway necessary for OX40L function, rendering additional interference of OX40L unnecessary. Similarly, the essential requirement for CD40 signals has been further analyzed. We initially described the presence of OX40L on human T cell lymphotropic virus type 1-infected T cells and here determine that OX40L expressed on T cells is capable of inducing significant T cell costimulation. Thus OX40-OX40L interaction during EAE is a complicated interplay between T-APC and T-T interactions in the CNS. In conclusion, this interaction appears to alter the generation of MOG-responsive T cells and production of proinflammatory cytokines due to dysfunctional CNS APC signals, detrimental in the priming of pathogenic T cells. Furthermore, as a consequence, OX40L function is both strongly CD40 and CD28 dependent and thus clearly participates in both the priming and maintenance of autoreactive T cells. The multiple roles of OX40L interactions make it an important candidate for controlling autoimmune disorders. We thank Dr. H. Kikutani for the kind gift of CD40−/− mice and R. Mamiya for her excellent technical assistance. ↵1 This work was supported in part by Core Research for Evolutional Science and Technology of the Japan Science and Technology Corporation, and a grant-in-aid for scientific research on priority areas from the Ministry of Education, Science, Sports and Culture of Japan. ↵3 Abbreviations used in this paper: OX40L, OX40 ligand; EAE, experimental autoimmune encephalomyelitis; Tg, transgenic; MOG, myelin oligodendrocyte; PLP, proteolipid protein; m, mouse; DAS, disability score. Stüber, E., M. Neurath, D. Calderhead, H. P. Fell, W. Strober. 1995. Crosslinking of OX40 ligand, a member of the TNF/NGF cytokine family, induces proliferation and differentiation in murine splenic B cells. Immunity 2: 507-521.